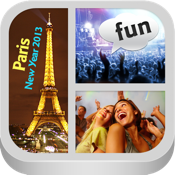 MOST USER FRIENDLY PHOTO FRAME APP! EASY COMBINE & LABEL or TEXT MULTIPLE PHOTOS INTO one FRAMED HD PICTURE. Tell your story via great photos or images and share them with your family and friends via Instagram, Facebook, Twitter, Flickr, SMS and Email. This is your most easy and pleasant photo collage creator and maker! What are you waiting for? Download this amazing Pic Frame Photography quality app Right Now!! !